Consumers Power Company (now Consumers Energy) built Five Channels Dam in 1911 an 1912. 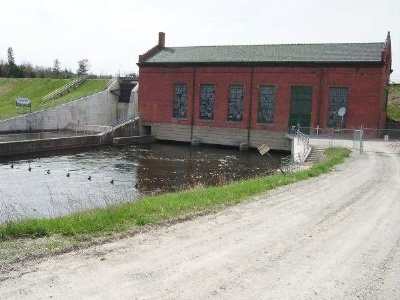 It was the second of six hydroelectric plants to be built on the lower Au Sable River by the Foote brothers of Jackson (founders of Consumers Power). During construction the company sought to provide a healthy environment for workers and their families by building a forty-five-acre camp complete with a central water supply and sewage system, icehouse, school, washroom, store and boardinghouse. Workers received land on which to build a house. Housing ranged from log or clapboard to tarpaper shacks and tents. Camp buildings were moved to the next site (Loud Dam) or razed as the plant neared completion in late 1912.